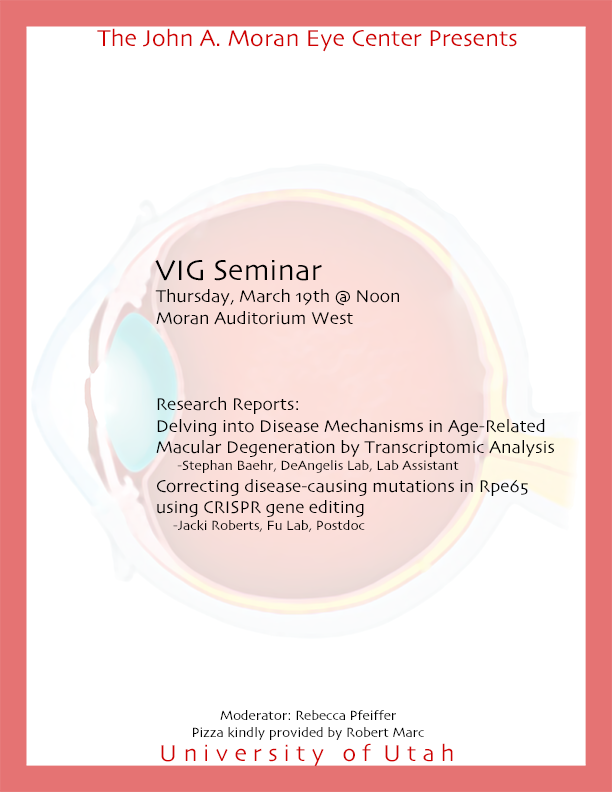 There is an upcoming Vision Interest Group featuring Stephan Baehr from the DeAngelis Lab and Jacki Roberts from the Fu Lab. Will be held on March 19th at noon in the west John A. Moran Eye Center Auditorium. 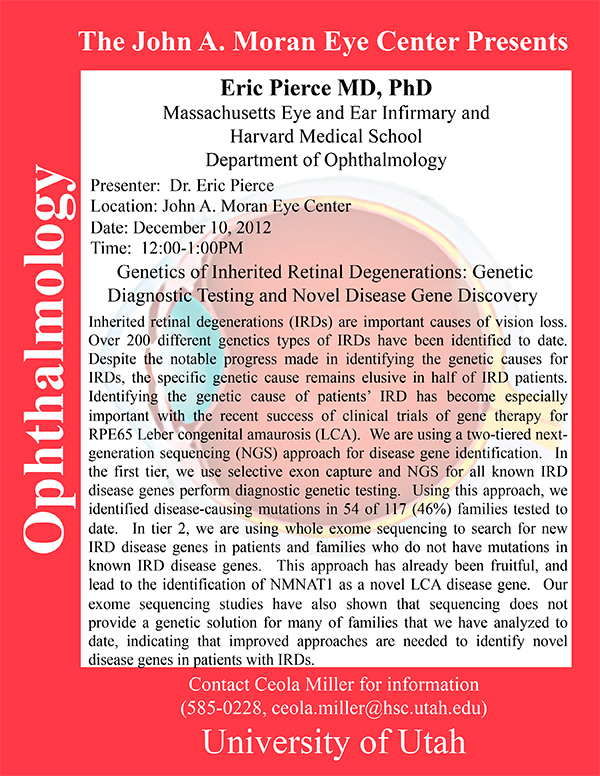 Eric Pierce from the Massachusetts Eye and Ear Infirmary and Harvard Medical School Department of Ophthalmology will be delivering a talk on Genetics of Inherited Retinal Degenerations: Genetic Diagnostic Testing and Novel Disease Gene Discovery Monday, December 10th at 12:00pm in the John A. Moran Eye Center Auditorium. Inherited retinal degenerations (IRDs) are important causes of vision loss. Over 200 different genetics types of IRDs have been identified to date. Despite the notable progress made in identifying the genetic causes for IRDs, the specific genetic cause remains elusive in half of IRD patients. Identifying the genetic cause of patients’ IRD has become especially important with the recent success of clinical trials of gene therapy for RPE65 Leber’s congenital amaurosis (LCA). We are using a two-tiered next- generation sequencing (NGS) approach for disease gene identification. In the first tier, we use selective exon capture and NGS for all known IRD disease genes perform diagnostic genetic testing. Using this approach, we identified disease-causing mutations in 54 of 117 (46%) families tested to date. In tier 2, we are using whole exome sequencing to search for new IRD disease genes in patients and families who do not have mutations in known IRD disease genes. 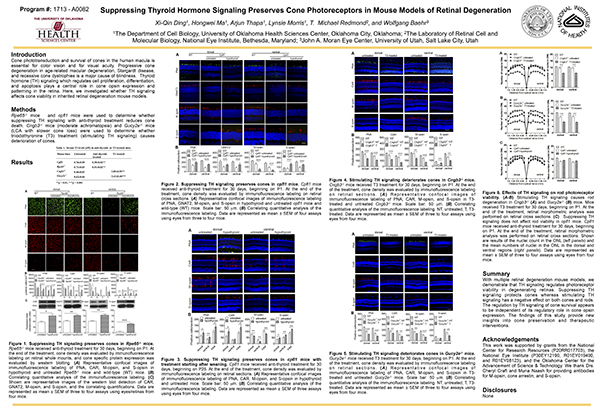 This approach has already been fruitful, and lead to the identification of NMNAT1 as a novel LCA disease gene. Our exome sequencing studies have also shown that sequencing does not provide a genetic solution for many of families that we have analyzed to date, indicating that improved approaches are needed to identify novel disease genes in patients with IRDs.